Numbers is a game of mental arithmetic. 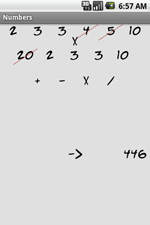 The goal is to combine six numbers with arithmetical operations to get a target number. Numbers can only be used once, but not all numbers have to be used. The computer can invent and solve such problems. The game appeared as part of a french TV show "Le Chiffres et le Lettres". The program can be downloaded via the Android market. It is a free app.